For many of the 300,000 people living in the IDP camps in Wanni, a simple hot meal has become a luxury they hardly dare dream about. Wanting to make at least a little difference in the lives of these Sri Lankans who have seen so much suffering these past few months, the Chefs Guild of Sri Lanka has stepped in to help by doing what they know best; cooking. The programme they will launch along with Give2Asia, and Sarvodaya, aptly named ‘Helping Hands’, will see members of the Chefs Guild cooking 30,000 meals a day for those in the IDP camps. For the chefs more accustomed to working in the state-of-the art kitchens of the country’s five star hotels, this is indeed a challenge but they are more than willing to rise to the occasion. “When we saw what was happening and the situation in the camps we knew we had to step in and help in any way we could. Many of the people were donating dry rations and some were providing cooked food which has the likelihood of going bad. People who are cooking inside the camps have no technical knowledge or the experience needed to cook for a large number like 250,000 people. We have the technical knowledge and the experience and we thought we should share it with them and make their burden easier to bear,” said Chef Gerald Mendis, Chairman of the Chefs Guild of Sri Lanka. “When the tsunami struck our shores, we stepped in and provided cooked meals to the affected people. Give2Asia was a partner there as well. I spoke to Sharadha de Saram, the Programme Consultant for Give2Asia Foundation and she immediately stepped on board and also suggested that we partner with Sarvodaya Foundation which is already providing food for the IDPs,” said Chef Mendis. They went to work straightaway. “We set about implementing the programme as soon as we agreed on the concept. The day after the initial meeting we went to Vavuniya to assess what needed to be done,” said Sharadha. The Chefs Guild plans to provide three meals a day for the 10,000 IDPs in Manik Farm camp Zone 2, Sarvodaya blocks 1, 4, 5, 8, 9. They have already made improvements to the community kitchens there. Different menus have been planned and consideration will be given to nutritional aspects. The food is provided by the World Food Programme (WFP) whereas all the ingredients and improvements in the diet will be provided through donations from the public (see box). “We have spoken to a number of hotels and hotel management companies such as John Keells Holdings and Jetwing Hotels and they have promised to help,” said Chef Mendis. 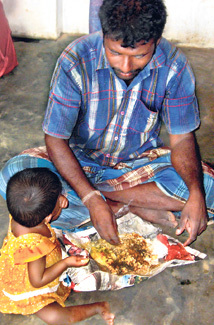 Eight chefs will go to Vavuniya every week and will cook in six community kitchens that have been set up in the blocks. "Our chefs have the capability to do anything with any food and create a good meal anywhere from five star conditions to a community kitchen so we can adjust to any situation," said Haleesha Weerasinghe, President of the Chefs Guild who will be going to the camps. “Cooking food for so many people is no easy task. We have to look at doing it systematically and we have to micro plan about issues such as quantities to prevent any possible wastage or shortage because the numbers in each zone are different. For this we need technical know how in cooking. 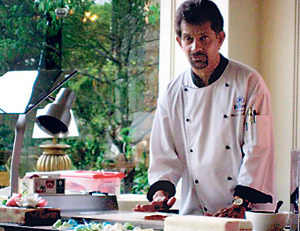 This is where the chefs can come in a big way,” Dr. Vinya Ariyaratne, Executive Director of Sarvodaya said. “We are hoping to come up with a programme for these youth to be trained in cookery. So when they get out of the camp they will be able to make a career out of it. We lack the funds and are looking for donors to set up a proper programme,” Sharadha said.